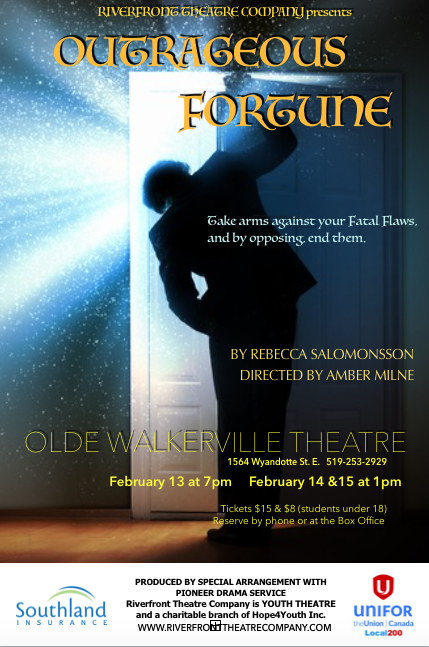 Outrageous Fortune: February 13-15, 2015 at The Olde Walkerville Theatre! Friday , February 13 at 7 p.m., Saturday and Sunday, February 14th and 15 at 1 p.m.
Riverfront Theatre Company’s Senior Ensemble Presents Outrageous Fortune, a Shakespeare-inspired comedy in which Shakespeare’s tragic characters are taking part in a group therapy to remedy the wrongs perpetrated on them in their own plays. Laugh along as rebellion bursts out between the cast members of Hamlet, King Lear, Richard III, Othello, Romeo and Juliet, and the Tempest. The characters wrestle with one another (sometimes literally!) and with their own actions in the play, trying to place the blame on their Fatal Flaws – who are personified in this zany bunch of drama kings and queens! Tickets can be ordered through the Olde Walkerville Box Office, or purchased at the door an hour before each show, at 1564 Wyandotte St. E., 519-253-2929. Previous: Previous post: Coming up soon! Next: Next post: Please Join Us for Breakfast!